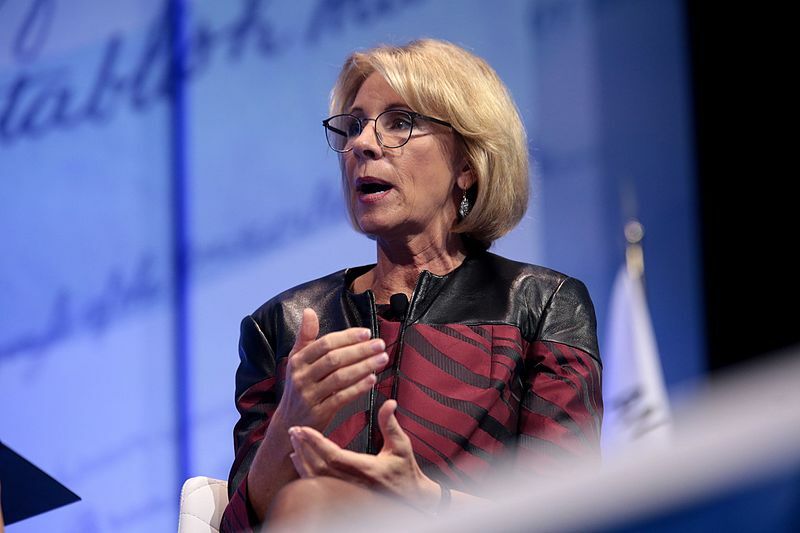 Education Secretary Betsy DeVos will soon publish a new draft of the Title IX rules which govern campus sexual assault cases. The rule changes have been made to provide further protection for students accused of assault, will narrow the definition of what constitutes sexual assault, as well as determine that schools can only review cases when the incident occurred on campus itself. In the leaked draft from August, the administration initially proposed providing schools with the option of incorporating cross-examination into their procedures. In the current version of the Title IX changes, the cross-examination provision is mandatory, but questions can be channeled through a third party and the accused and accuser would not have to be in the same room. The rules would also bar the accused from asking their accusers questions such as details of their sexual history. The one positive change for survivors being included is that now both parties may appeal a decision; before, only the accused could appeal. While these changes to Title IX are trouble, the most potentially traumatizing change is of cross-examination. Being cross-examined by the accused, even from separate rooms, should not be an additional burden that survivors must face when coming forward. The proposed changes will benefit predators while harming and betraying student communities. President Donald Trump, who has been accused by at least 22 women of sexual violence, spoke to the nation earlier this year, saying that it is a “very scary time for young men in America” when “you can be guilty of something you may not be guilty of.” United States law enforcement agencies, along with agencies around the world, maintain that false accusations for sexual violence is anywhere from 2-8%, making it comparable to false accusations in regards to other types of criminal behavior. However, Secretary DeVos is determined to grant more rights to the accused than to the survivors through Title IX, allowing predators to avoid consequence and allowing corrupt administrations to sweep abuse under the rug. These guidelines, which allows perpetrators to question survivors, reduces college administrations’ responsibilities to survivors, limit the definition of sexual harassment, and give administrations the ability to use a higher standard that what is usually required in non-criminal proceedings, is a devastating blow to survivors and academic communities. These rules will not only affect students but anyone who trains at colleges or universities, such as the gymnasts at Michigan State who were groomed and attacked by Larry Nassar. Once the rules are published, the public will be given a window to comment before the rules go into effect. We strongly encourage everyone to review the Title IX changes once published and make your voices heard by contacting the Department of Education. We will have updates on our social media.